Girls Learn International, (GLI), was founded in 2003 by Lisa Alter and her two teenage daughters, Arielle and Jordana. They wanted to show that humanitarianism has no age requirement and that youth play a critical role in leading the movement to affect positive change for girls and women all over the world. Girls Learn International’s mission is to give U.S. students a voice in the movement for universal girls’ education. With over 114 chapters in 25 U.S states, GLI helps hundreds of middle and high school students become more educated and involved in girls’ rights throughout the world. GLI helps students discover that through their own creative initiatives, dedication, and passionate leadership, they can create real solutions that address the obstacles facing girls and women here and around the world. 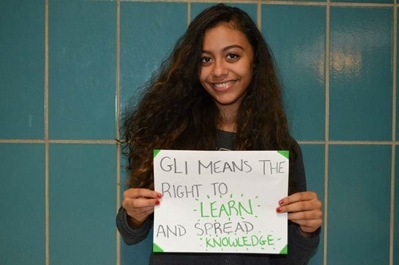 Student-to-student, and student-to-parent, GLI is building a movement of informed advocates for universal girls’ education and a new generation of leaders and activists for social change. Chapters have the option of being partnered with a school abroad. Through an online communication center schools can write to one another and have impassioned and informed discussions. This level of communication allows students to gain new perspectives and insights on human rights as well as connect with student activists globally. All partner schools are located where girls’ lag behind boys’ in access to education. They are all schools that have an initiative to promote girls education. These countries include: Afghanistan, Cambodia, Colombia, Ghana, India, Malawi, Kenya, Nepal, Pakistan, Tanzania, Uganda, and Vietnam. 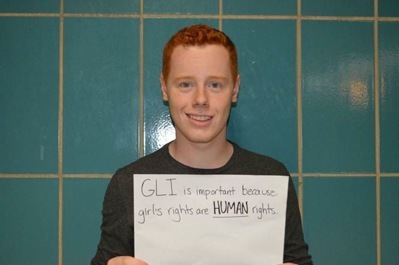 GLI developed a curriculum that focuses on human rights, feminism, and girls’ education. Meetings range from child marriage to media literacy. The curriculum serves as an aid to student leaders as they run their own chapter meetings. Through regional Student Advisory Boards students all over the country can network and share best practices. Furthermore, students have the opportunity to apply to be a part of the GLI delegation to attend the United Nations Commission on the Status of Women. See the Girls Learn International Blog for first-hand accounts on student activism.